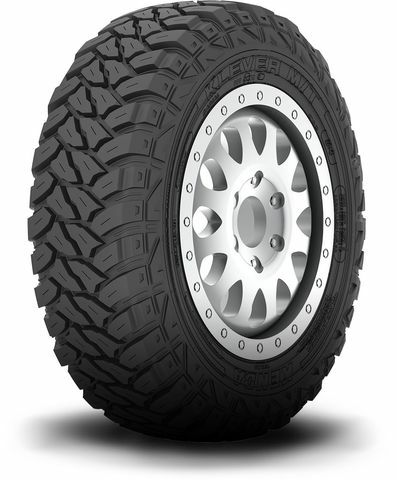 235/85R-16 N/A 0 lbs 0 psi 19/32nds N/A 0" N/A 32"
Purchase includes the Kenda Klever MT KR29 tire only. The wheel rim shown in the picture is not included. Picture provided is a stock picture from the manufacturer and may or may not reflect the actual product being ordered. All Kenda Klever MT KR29 tires are continuously developing with manufactured improvements. With that said, Simple Tire and the manufacturers have the right to change these tire specifications at any time without notice or obligation. Please Note: Specifications of the Kenda Klever MT KR29 tires shown above are listed to be as accurate as possible based on the information provided to us by Kenda tires. These tires have been absolutely great. They look awesome on my 2012 Jeep Wrangler Sport and handle great. I'm at a few hundred miles on them but have had the opportunity to drive them under many different conditions. Relatively deep snow, rain, dry road, off road, these tires have handled wonderfully. I left tread life out as I am hoping I get a few years out of these tires so I can't comment on that, though I will down the road as I put more miles on them. Other than that these tires have exceeded my expectations even with the good reviews they've received overall. I am totally pleased with the performance and have increased confidence in any driving condition especially off road where I spend a lot of time and these tires just eat the mud. Highly recommended. Overall, very impressed! Quieter then my Generals and better ride at half the cost. Excellent!! only 4 starts because only have 2,000 miles on them so far. As I only just received the tires my review is based mostly on the excellent service provided by simpletire. They arrived in brand new condition on the day between the expected date. Shipping was excellent and getting all 5 tires in an excellent amount of time, just a few days after purchasing more than made up for the experience i had previously with a major retailer (starts with a w.. ends with almart lol) that sells tires on their website. These tires look and feel great on my '12 jk. I will be providing a later review on the tires themselves as I accumulate miles. At the price though any shortcomings is ok but I have faith that the good reviews are well warranted. I couldn't be happier with my purchase and simpletire at this point. I will be sending everyone I know in the market for tires to this site.